My automobile hobby naturally started with the purchase of my first car (a Renault 19), which also coincided with the beginning of my IT career. In 2002, I got engaged with motorsports, actively participating in competitions as a pilot until 2008, when I became a Candidate Master of Motor Sports of Ukraine. These days I rarely take part in contests, though I often organize them. For example, last year Kharkiv hosted GlobalLogic Classic Rally on stock cars, and I managed the organization of this event. Apart from that, I have other automotive hobbies that are closer to the IT field. For a long time, I’ve been working with a Speed Car Laboratory at KhNAHU (Kharkiv National Automobile and Highway University), helping create injection engine control systems and electronic equipment for their high-speed cars. 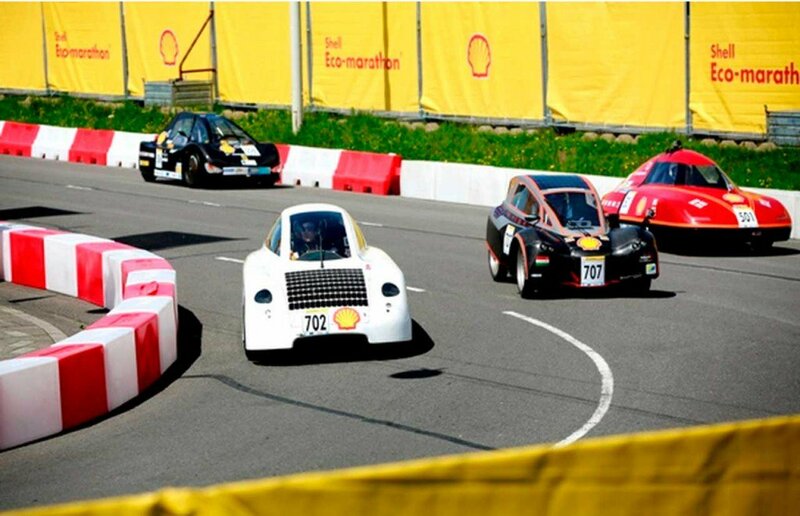 Six years ago I became interested in an ecological automotive project called Shell Eco-marathon. In this competition, student teams have to construct a vehicle that is able to cover a certain distance with minimal gasoline consumption. The team whose car is the most energy-efficient wins the competition. My fellows from KhNAHU and I have been tracking this competition since 2008. 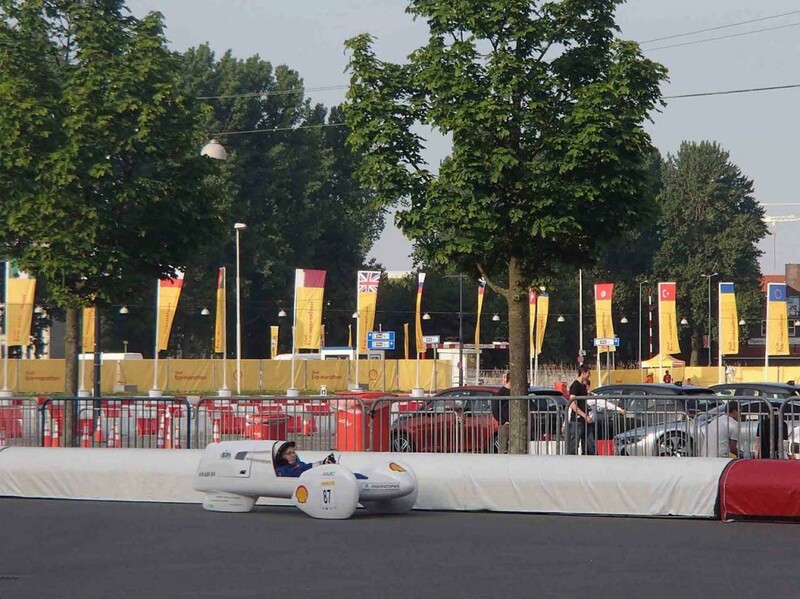 In 2009 we built our own eco-vehicle, and since 2010 we’ve been participating in the Shell Eco-marathon in Europe. This year’s event in Rotterdam gathered about 200 teams from Europe. There are a range of races within the competition, which are divided into two main groups: Urban Concept and Prototypes. We participated in the Prototypes races, which is for custom-made three-wheeled (or sometimes four-wheeled) vehicles. At first glance these vehicles don’t really look like cars, but they have all the necessary parts. However, unlike Urban Concept participants, we are not obligated to use real automotive elements in our prototype — which is why our vehicle’s construction was based on… bicycle units. My role in this project involved developing the car and getting it ready before the race. I worked on the engine control system and a telemetry system assembled from easily accessible electronics, namely an Android smartphone and a PC-connected Bluetooth module. This system is used to control and and manage the operation of the engine during its warm-up. During the race, the smartphone is attached to the pilot’s back, and he can see the indicators on the mirrors inside the car. It really helps in the course of the race. The competition race is very similar to driving in a city. Fifteen cars pull into the track, one after another. It’s important to take many circumstances into account while driving: you have to choose the best place and proper manner of driving so that you don’t get caught in a pack of cars on the track. Besides that, you have to keep in mind your fuel expenditure and start the engine no more and no less than necessary. According to the rules, the average speed should be no less than 25 km/h or, to be precise, you have to cover 10 laps (total length: 16 km) in 39 minutes. When our car enters a race, it usually accelerates up to 30-35 km/h, upon which we turn off the engine and move inertially till the speed drops to 22-23 km/h. Then we start the engine again for 3 or 4 seconds to pick up speed. At a 1.5 km distance (one lap) we have to turn on the engine only 3 or 4 times. It’s just a few runs, isn’t it? But the strongest team of the competition only turns on their engine just once for a few seconds! In 2013, we covered the required distance on 32 ml of gasoline. In other words, we covered 476 km with 1 liter of gasoline. We scored 22nd out of the 90 registered participants in our group. Moreover, we were among the top-50 racers overall, which is actually not bad. Our 2010 race result, 570 km on 1 liter of gasoline, officially entered the Book of Records of Ukraine! Unfortunately, at the 2014 competition, we couldn’t pass the whole distance and record the result officially. Nevertheless, we have on-board telemetry data for the first six out of sixteen kilometers of race track. According to this data, the result could have amounted to about 1150-1230 km with 1 liter! This achievement is a result of changes in the fuel supply system. 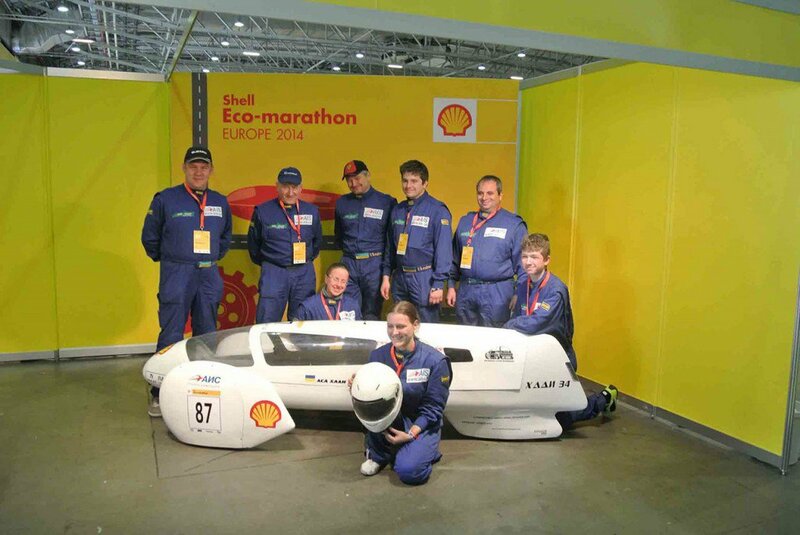 This result cheered us up, and we are determined to confirm our progress at Shell Eco-marathon next year. Besides that, we have an idea to develop a program that would suggest the best strategy of driving depending on a racing situation. Such a strategy is very important during the competition. Still, a lot depends on the driver’s proficiency, vehicle design, and investments in it as well. For instance, our car is made of fiberglass. The total weight of the construction, including the engine, is 43 kg. It seems to be a light machine, yet the French team — a leader in the 2013-2014 competitions — has a car of a similar design that weighs only 18 kg. The price of the body is also very different: our car’s body costs $3000, while the French team’s body equals to €8000-12000. Besides that, a carbon body can be manufactured only in Western Europe, and preferably you have to get a few similar constructions to experiment. The same goes for an engine. We use a ready-made motor converted to an injection engine. In fact, it is a motor from a hand-controlled grass trimmer. The engine capacity is 35 сс. Actually, the French team has a motor of the same capacity, but it was tailor-made to achieve the lowest fuel consumption due to the highest energy efficiency. It is an unusual motor with very long piston strokes. At the same time, it is not universal: this engine can only work on one vehicle. But its energy efficiency is proven: in 2013 it took the car only 7 ml of fuel to cover 10 km. This year the French team concentrated on driving mode optimization and the introduction of low-friction ceramic bearings. It gave them an opportunity to add another 700 km to their figures and record a result of 3314,9 km with 1 liter of gasoline. We haven’t reached the best possible result on our car yet, and in 2015 we are ready to come up with better figures and prove them officially. I think that young students in our team have a huge potential because the word “impossible” is absent from their minds. Myself, I often pay too much attention to constraints, quality requirements or costs, while missing opportunities, and then I refuse. “Let’s do it?” — “No. It’s impossible because…” But the students still don’t know it They know nothing about the impossibility — and therein lays their strength! Sure, they often lack knowledge … But still, my best motivation is to suggest creating something and to hear “Sure, let’s do it!” In fact, we usually succeed! By the way, this principle also applies to innovations in IT projects. The most initiative engineers often become idea drivers, even when they don’t have enough experience. Ultimately, they achieve great results and inspire their colleagues both in professional projects and hobbies. Sergiy Podnos is a Senior Project Manager at GlobalLogic Ukraine with over fourteen years of experience in the IT industry.